When on holiday at the Yelloh! Village Les Ramières, enjoy a relaxing stay in the heart of nature and the Drôme Provençale. Take a trip to the town of Nyons and explore a delightful corner of paradise on the banks of the river Eygues. Known as the "Little Nice" of the Drôme for its microclimate, this is the perfect spot for a great holiday in the sun! Nyons lies at the foot of the Massif des Baronnies Provençales. A land where nature reigns, it offers fabulously varied mountain and Mediterranean landscapes. A dream come true for nature-lovers! Famous for its vineyards and renowned olive grove, officially certified "site remarquable de goût", don't leave without trying the local black olives or particularly fruity Nyons olive oil. Take your taste buds on a journey! Nyons is the ideal destination for your next holiday. 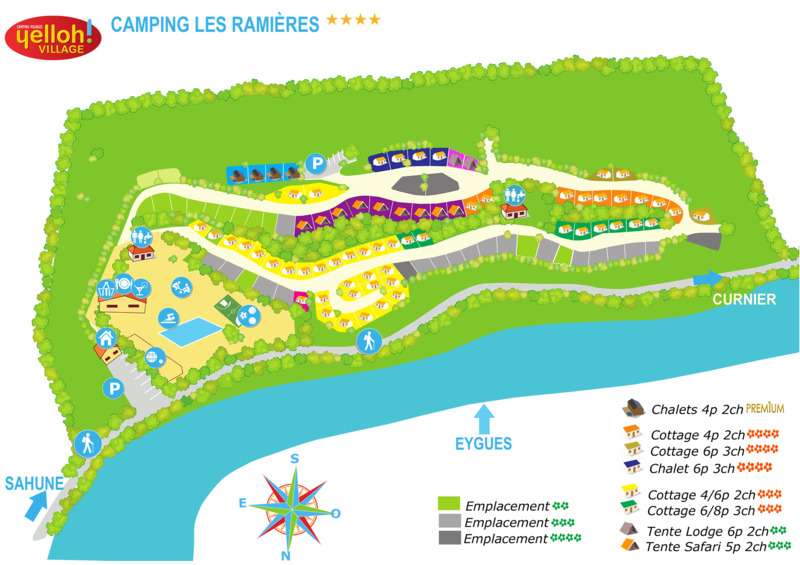 The camping Les Ramières welcomes you to the authentic Drôme! Gorges, waterfalls, forests and scenic nature at its best make this an exceptional area. Enjoy walking? Head off for Diois, where its many footpaths will take you through some gorgeous scenery. Visit the towns of the Drôme, each with its own character. Don't miss a trip to Montélimar during your holiday and savour the scents and flavours of the capital of nougat. For something completely different, explore the outstanding archaeological sites of the Gallo-Roman town of Vaison-la-Romaine. Animal-lovers will be fascinated to discover some unusual species at the Pierrelatte crocodile farm near the campsite. Home to some 400 different species this is one place you and the kids are certain to love. Or admire the vultures of Rémuzat, an unforgettable sight as they soar above the Drôme cliffs. Choosing your favourite activity may not be easy!